Jeremy Lake is heading up the bar program at this new West Hollywood hot spot. When a new restaurant wants to make an impression in L.A. sometimes being the fanciest vegan eatery with an Oprah-approved chef just doesn’t seem like enough. Quality craft cocktails helps lots…says the girl whose hobby is drinking. Initially for its March opening, Chef Tal Ronnen’s Crossroads had world-renowned mixologist Gaston Martinez create the drinks. But starting this month and going forward, the restaurant put barman Jeremy Lake (Rivera and recently closed Playa), who helped open Crossroads, in charge of the cocktail program. 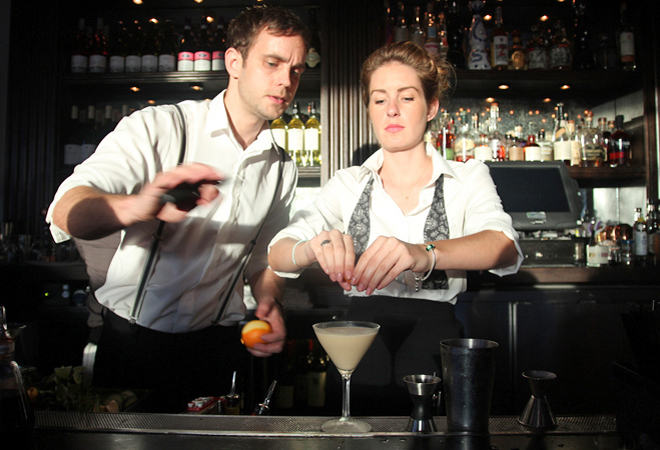 They won’t differ too much from what cocktail geeks have learned to expect and love from the Cox cocktails. “It’s not like I’m going to set my Manhattans on fire,” joked Jeremy. But he will “take the tools that Julian has taught me over the last three years working for his programs and extend off of that with my own thoughts and my own ideas, and maybe tweaking recipes in ways that more fit my palate and get to experiment and have fun with that.” He says that the differences will be miniscule, like measurements miniscule, oh and that everything will also be vegan-friendly. Yup, no honey, egg whites or any ol’ sugar in these craft cocktails. Vegans can imbibe comfortably with the knowledge that Jeremy, although not a vegan himself, has researched every ingredient and ran the drinks by Chef Tal. Here are some of the drinks off Jeremy’s new menu which serves to complement Chef Tal’s Mediterranean-inspired dishes.